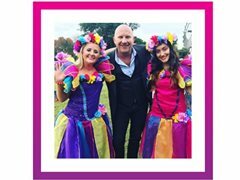 Fairy Wishes are currently looking for Energetic, Bright and Bubbly Children's Performers to host children Parties in character and entertain children at Festivals, Shopping Centre Shows and Corporate Kids Events. Fairy Wishes are Sydney's Leading Children's Entertainment Company in which applicants must be available on weekends and school holidays and can easily drive to events and parties in costume (all which is provided by our costume department). All performers require a working with children's check which can be applied for if successful.